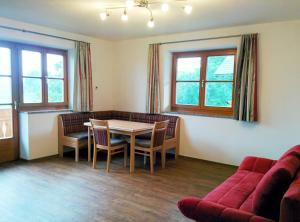 Apartment Parkvilla Traunsee price per day from € 120 The modern and elegant Apartment Parkvilla Traunsee features a terrace and is located 200 metres from the banks of the Traunsee lake and from the centre of Altmünster. There are 2 double bedrooms and a living room with a kitchenette and a comfortable sofa. The Green House, Zum Grünen Haus . Landhotel Gasthof Bauböck price per day from € 68 Andorf’s Landhotel Gasthof Bauböck is located at the town’s market square. The property has a beer garden and a restaurant that serves seasonal, regional cuisine. Rooms at Landhotel Bauböck have a private bathroom, wooden furnishings and a flat-screen TV with satellite channels. 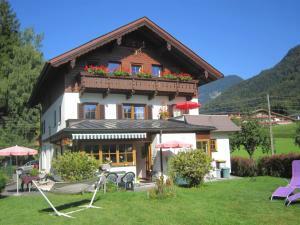 Eidenberger Alm price per day from € 49 Eidenberger Alm has a garden, seasonal outdoor swimming pool, tennis court, sled run, children’s playground and a terrace with views to the Dachstein Mountain. Several have wooden floors and a balcony and Wi-Fi is available free of charge. Hotel Schloss Mühldorf price per day from € 91 This medieval castle turned into a 4-star resort is located in Upper Austria’s Danube Valley, just 20 km from Linz. The spacious, individually furnished rooms offer cable TV, a minibar, and a bathroom with bathrobes and hairdryer. Guests can use a large network of riding trails in the surrounding area..
Sonnenblumenhof price per day from € 60 Just 8 km from the Geinberg Thermal Spa, the Sonnenblumenhof enjoys a quiet location on the green outskirts of Mühlheim am Inn. Rooms at the Sonnenblumenhof have wooden furniture, satellite TV, and a bathroom. The guest card offers many discounts for attractions in the surrounding area, including the Geinberg Thermal Spa..
Espi-Stables Ferienhof Esterhammer price per day from € 50 Set amidst the scenic landscape of Upper Austria’s Mühlviertel region, this horse farm offers riding lessons and riding excursions. The Espi-Stables Ferienhof offers traditionally furnished rooms and apartments with a bathroom, as well as a daily breakfast with regional specialities..
Altmünster: recommended ski resort for beginners. Barenalm: recommended ski resort for beginners. Dachstein West: recommended ski resort for experts. Krippenstein: recommended ski resort for experts. Obertraun/Dachstein: recommended ski resort for beginners. St. Wolfgang: very good nightlife, many restaurants and pubs.